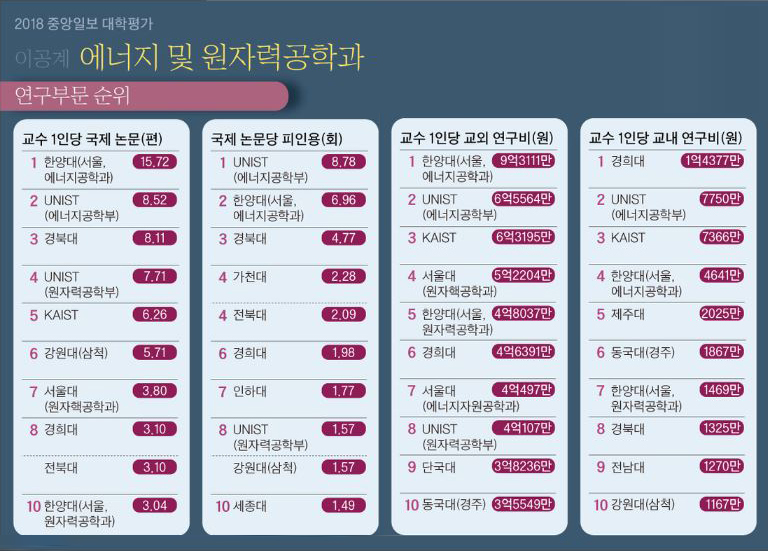 UNIST’s Business Administration Department ranks ‘Grade’ at 2018 JoongAng Ilbo University Evaluation. 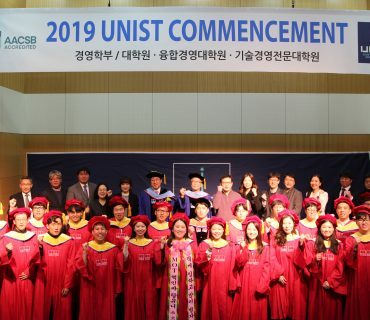 UNIST continues to grow by leaps and bounds, according to the JoongAng Ilbo University Assessment’s 2018 rankings, released on September 12, 2018. 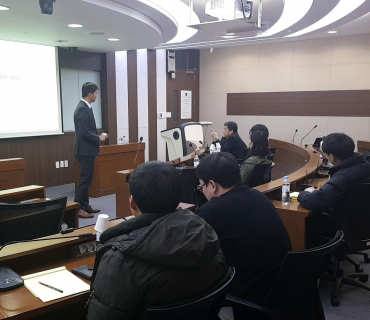 In celebration of the 53rd anniversary, JoongAng Ilbo conducted an assessment for academic departments at four-year universities in South Korea. 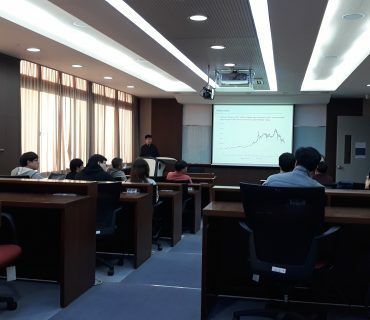 The evaluation encompasses 3 humanities (Business Administration, Korean Literature, Sociology) and 3 science & engineering (Nursing, Energy and Nuclear Engineering, Industrial Engineering). Among these departments, three tracks of UNIST (Energy Engineering, nuclear Engineering, Business Administration) have been ranked excellent. 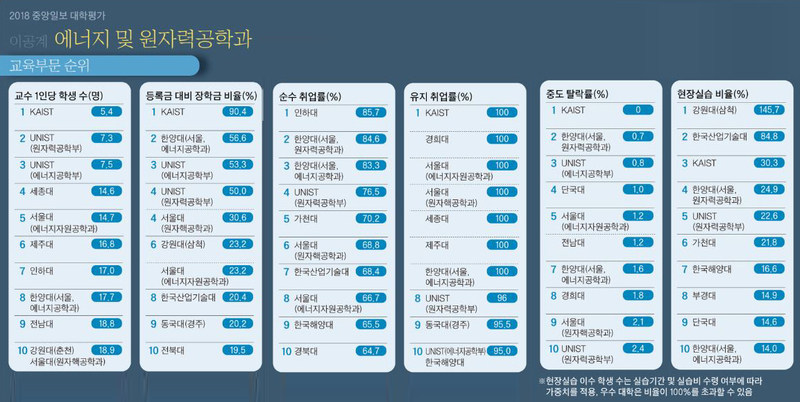 In this evaluation, the School of Management Engineering at UNIST, which is classified as industrial engineering, was not included, this year. The evaluation of science and engineering departments is based on 11 to 14 evaluation indices, including educational environment, research, finances, reputation, and performance of graduates in society. The overall rating is based on the scores totaled up (out of 200) and the top 10% are ranked ‘Top’, 25% as ‘High’, and 50% as ‘Intermediate-high’. In this evaluation, UNIST has made its marks as a leading institute for the research and education in some key areas in science and engineering. As indicated below, the publication included UNIST in the list of highest-rated university groups for its energy engineering track. UNIST also received high marks in its nuclear engineering and business administration tracks. The rankings aim to help prospective students identify the nation’s leading schools in their chosen field, with the list of subjects extended each year in response to high demand for subject-level comparisons. Energy crisis is one of the major challenge facing our planet, today. For this reason, leading academic institutions and organizations around the world are working hard to develop more efficient and stable clean energy technologies. 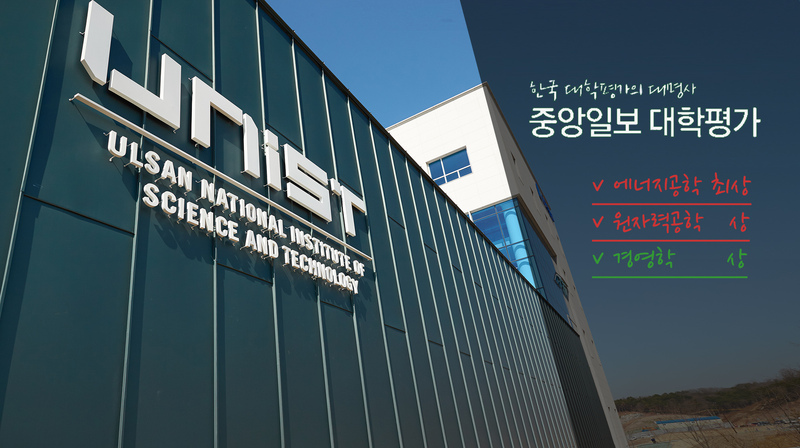 UNIST has been also actively involved in research in the area of new and renewable energy through the development of electric car batteries, solar cells, seawater-activated batteries, and next-generation catalysts. [2018 JoongAng Ilbo University Assessment] Performance evaluation of research in energy and nuclear engineering department. Researchers in Energy Engineering track at UNIST are working hard to promote the nation to the international community. 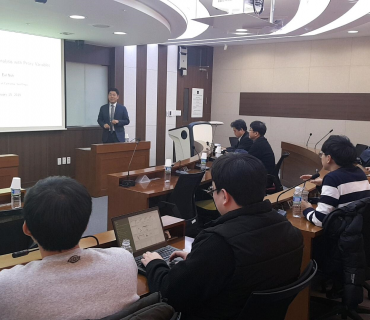 Headed by Professor Jaephil Cho in the School of Energy and Chemical Engineering, many of the important positions in secondary battery field are occupied by world-renowned researchers. Besides, the Industry-Academia Battery R&D Center at UNIST is said to be the world’s largest R&D center for batteries operated by a university. In addition to Professor Sang Il Seok, the pioneer in the field of perovskite solar cells, Professor Jin Young Kim and Professor Changduk Yang are also leading the next generation solar cells. Professor Youngsik Kim, who proposed the concept of ‘seawater battery’, which stores electricity in seawater is also working hard to put the invention to practical use. 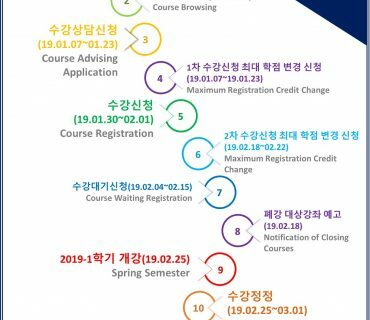 [2018 JoongAng Ilbo University Assessment] Performance evaluation of education in energy and nuclear engineering department. These achievements are clearly shown in the number of citations per international paper. The average number of citations per article by UNIST professors in energy engineering track is 8.78 times. This also shows that the research direction, which emphasizes quality rather than the number of articles has led to a quality study. The Nuclear Engineering track at UNIST is relatively small, yet made a strong appearance in the assessment. The department currently has about 8 faculty members. 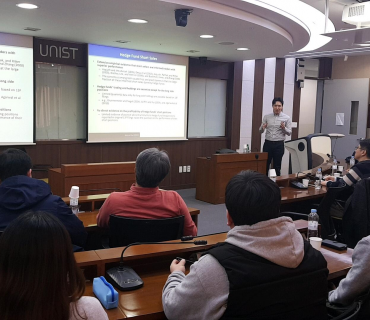 Except for those universities with combined energy and nuclear engineering departments, UNIST attracts a great deal of attention on a number of other indicators than Seoul National University. The Business Administration track at UNIST has been ranked ‘excellent’, surpassing 59 other universities. 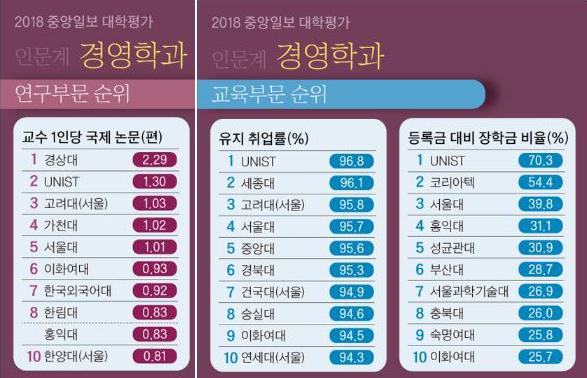 [2018 JoongAng Ilbo University Assessment] Performance evaluation of research (left) and education(right) in business administration department. 2018년도 9월 1차 연구세미나 공지 (Notice of Research Seminar 1, ..
2018년도 10월 1차 연구세미나 공지 (Notice of Research Seminar 1,..